Legalization of marijuana across different states has brought about the invention of different forms of the plant. The more popular variants include wax, shatter, oil and hash. Wax and shutter are increasingly becoming popular as a means of medical marijuana consumption. The two variants have high concentrations of THC which allows an effective high that assists patients in dealing with stress and pain. They both have several similarities other than their concentration. The term used to refer to these two variants is BHOs (Butane Harsh Oils). This is because the procedure of making them involves the use of butane to extract the needed terpenes and cannabinoids resulting in a highly concentrated content. The THC concentration of smoking the herb on average can be around 22%, but these concentrations can be up to 80% or even higher. We can conclude as that this could be the main reason why they have gained popularity that much. Both are also used for recreational and medical purposes. Just as the name suggests, marijuana wax is very similar to ear wax. The molecules of this oil crystalize from the agitation process, resulting in a butter-like appearance. The term wax is collectively used to refer to the gooey waxes called budder to the medium soft ones to the harder ones referred to as crumble or honey comb. This opaque array of oils achieves the loss of transparency through the extraction process where lower heat is used. Making wax starts with stirring, whipping up and shaking the concentrate during the extraction process using butane. The molecules get agitated during this stage, leading to a rather crumbly final product. Lower temperatures are applied in the process of making the wax. Shatter is a glassy, transparent and flawless weed extract that is perceived to be the purest form available. However, translucency is not always an indicator of quality. The potency, texture and its consistency play a key role in classifying this extract. The final product of shatter is clear or translucent due to the production process which leave the molecules undisturbed or agitated. When the molecules are not agitated, the resulting product is a clear glass-like extract. The heat levels, terpene content also affect the texture of the resulting product. The oil extracts that fall within the texture category of glassy to viscous sap are all referred to as ‘pull and snap’. Shatter is quite popular especially in the USA and Canada’ s retail market. Dab is the slang term used to refer to it, this came about from the smoking process that requires a glass pipe. The THC levels in shatter can range from 50-85%. Making shatter involves blasting weed concentrates in columns that contain distilled or liquid butane. This separates the cannabinoids and the trichomes from the plant residue. The mixture is then heated in a vacuum pump for up to two days. This removes the butane concentrate. Once the process is complete the final product is a glass like texture that is quite brittle. 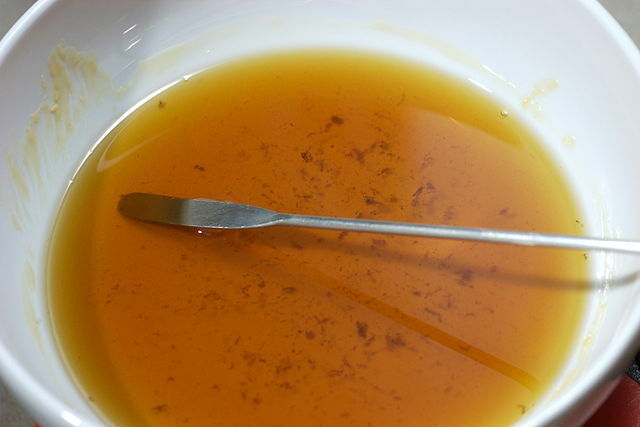 Wax extract is opaque and the color ranges from beige to brown. Shatter on the other hand is transparent or translucent and has a golden hue. Shatter is brittle and glass-like in texture. Wax appears to be crumbly is soft and has a butter-like texture. 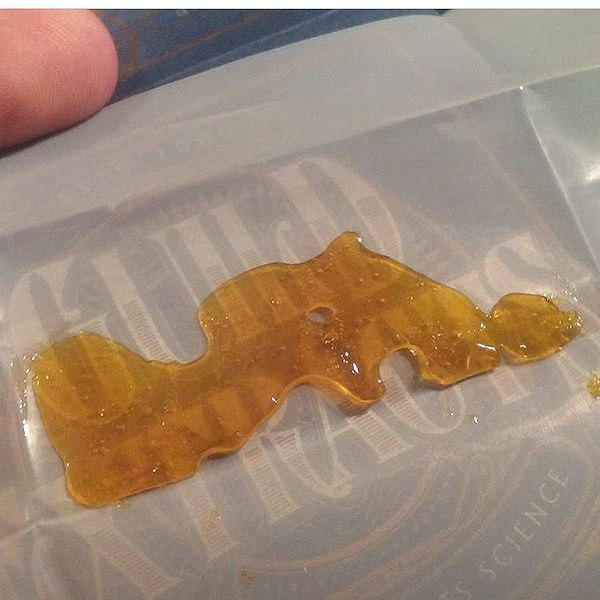 It is easier to handle wax than shatter due to the texture. Shatter easily crumbles while wax is solid. Wax has more aroma and is preferred by smoking enthusiasts this due less filtration in the making process. It also contains more terpenes. Shatter has less aroma as it passes through a thorough filtration process. Wax is less stable and doesn’t last as long as shutter. Shutter lasts longer as it is more stable. Wax is made using lower temperatures and the process involves very little filtration. Shutter is made using high temperatures and filtration is key in creating the final product. Wax has more trichomes. Shutter has less trichomes due to the filtration process. Both wax and shutter are weed extracts used for medical or recreational purposes. Wax is opaque and has a crumbly, buttery texture. Shutter is transparent and has a glass-like texture. They both have high concentrates of THC, which can go up to 85% depending on the process used. Recreational weed smokers prefer wax to shutter as it has a stronger flavor and aroma due to the presence of more trichomes. The process of making the two extracts is quite similar, they both require the use of butane to extract the cannabinoids. The difference arises from the agitation and filtration stages. Shutter making does not involve agitation but requires a lot of filtration. Wax production requires agitation and no filtration. Shutter is more durable than wax. Several states that have legalized cannabis, have however made it illegal to manufacture extracts from individuals’ homes. This is because the processes are very dangerous and require specialized equipment and expertise. The price of these extract Is much higher compared to purchasing the herb plant itself. Purchase costs can go up to $100 dollars for a few grams depending on the quality and source. Evah Kungu. 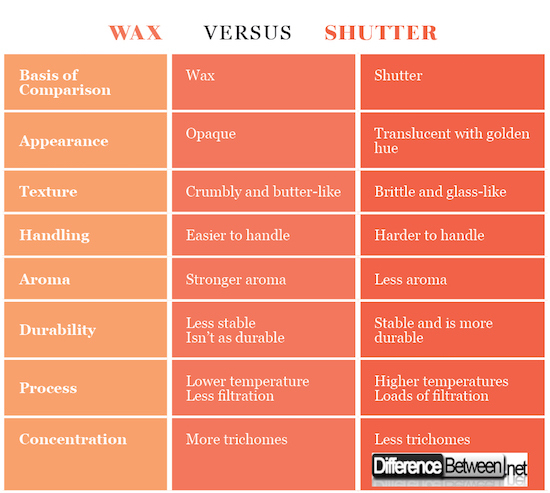 "Difference Between Wax and Shatter." DifferenceBetween.net. May 17, 2018 < http://www.differencebetween.net/science/difference-between-wax-and-shatter/ >. Potter, G., Decorte, T., & Bouchard, M. (2011). World Wide Weed: Global Trends in Cannabis Cultivation and Its Control. Ashgate Publishing, Ltd.
Bienenstock, D. (2016). How to Smoke Pot (Properly): A Highbrow Guide to Getting High. Penguin Publishing Group. Barrington, F. (2018). Weed All About It: A guide to growing, rolling, smoking, and eating your green. Ryland Peters & Small.